This stunning 14K white gold matching set was made in Dec. 2014. The engagement and wedding rings are sit nicely together with no gap. 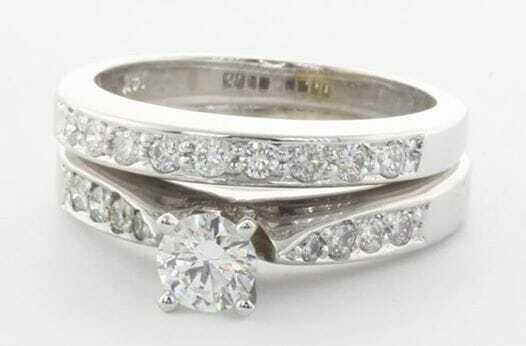 The matching set is set with high quality round brilliant diamonds which is totaling 1.16 carat. All side diamonds are G in colour and VS2 clarity. The centre diamond is D colour and SI1 clarity. The price for this is stunning set was only $3,580AUD. When looking to buy a matching set you will need to make sure you pick up the one that suit your need the most. Some customers do not mind to have a slight gap between the 2 rings and some prefer to have no gap at all. In regards to the metal, the rings can be made in white gold, yellow gold or platinum. Either one of these metal will create a stunning set that will last forever. In case you order the engagement ring first and the wedding ring at a later stage you want to make sure you ordering the same metal type, otherwise even if the rings are matching they won't look matching due to the difference in the metal type. You will find that some times you can even see a different in look for the same metal type that purchased from different jewelers. If you would like more information please feel free to contact us on 1300 361 873 or via the contact us page.